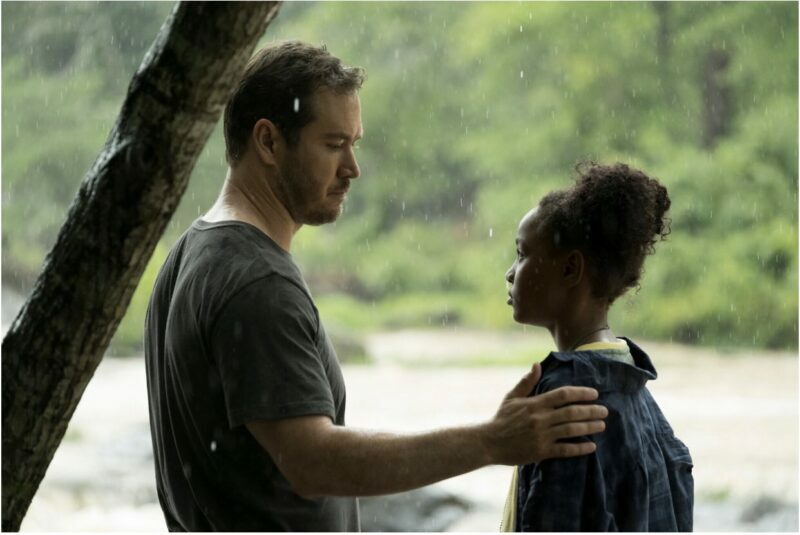 Based on the best-selling trilogy of the same name by Justin Cronin, The Passage on Fox aired its pilot Monday night. The season one première of this science fiction and character driven drama, was both heartwarming and thrilling leaving the audience wanting more. The opening scene fades in on the face of a girl staring out the window of a moving car, reflections of passing trees dance across her face, but the lush scenery is not enough to mask the fear and loneliness dancing in her innocent eyes. Her voice is heard speaking, narrating her innermost thoughts as her eyes slowly drift to the unseen driver. Her name is Amy Bellafonte (Saniyya Sidney), and this is her story. The Bolivarian Highlands in 2015 is where everything started. Scientific researchers, accompanied by members of the Bolivarian military, hike through the forest scape in search of a man who could change their research data. Leading the group is Dr. Jonas Liar (Henry Ian Cusick), Dr. Tim Fanning (Jamie McShane) and the head of research, Clark Richards (Vincent Piazza). It is unclear whether or not this mysterious man exists or if he does, how can he help. Playfully, Jonas asks Clark whether their funding will support their search, and Clark replies in playful banter that he cannot see a problem with traveling around the world in search of a two-hundred and fifty year old man with magic powers. The lightheartedness still could not mask the looming darkness they were about to walk into. Brought to a cave, they are informed that yes the person they are looking for is in there. Looking down into the opening of the cave, there is confusion when they see a boy sitting in front of a large cage. When he notices the scientists and soldiers looking on, he starts screaming, urging them to leave. One of the soldiers leading them starts yelling in a panic, and when Jonas asks their translator what he said, he is simply told, “Vampire.” Despite the warnings, Jonas and the rest of the team continue into the dimly lit cave where they come face to face with a creature that was less than human. Slowly the monster crawls from his prison. Upon seeing the strangers, it lets out a cry that resembles a high pitch screech. The creature lunges at Tim, biting him in the neck. Wondering his friend’s fate, Jonas sits alone in a hospital waiting room. The look on his face says Tim is dead. Slowly appearing from the darkened hallway, Tim reveals himself to Jonas, but something is different. Like a predator, Tim watches Jonas and observes his calm behavior, the change of color in his eyes, and how the neck wound that should have killed him seemed to be completely healed. Suddenly, Tim starts to bleed from his mouth, spitting teeth into his hand; the only thing Jonas can do is look on in horror as the impossible becomes possible. Tim Fanning (Jamie McShane). Photo courtesy of IMDb. Three years later, Project Noah is in effect. The project researchers are in need of human test subjects to test their virus that could change humanity completely. Finding healthy people willing to take part in their experiment is difficult, so Project Noah uses death row inmates because they are people who have already forfeited their lives that no one will miss. In Huntsville Prison in Texas, two FBI agents walk side by side down the row of steel bars. Agents Brad Wolgast (Mark-Paul Gosselaar) and Phil Doyle (Zach Appelman) sit down with an inmate named Anthony Carter ( Mckinley Belcher III). Carter is naturally resistant to the offer of being part of Project Noah and even asks about the other inmates who have already volunteered. The agents know they can not leave without Carter. To sweeten the pot, Brad propositions him with the idea of immortality. Instead of waiting out his execution, he could live forever. A hesitant Carter agrees to go with them. While at Project Noah, a crisis has surfaced. After being contacted by the Center of Disease Control (CDC), the scientists at the government-run Project Noah have been informed of a global pandemic. There has been an outbreak of the Chinese Avian Flu. There is no cure, and those who contract the disease, die within the same day. The CDC needs Project Noah to use their research to find a way to stop the virus before it can infect the United States. How can you stop something that has no cure? The team moves down to the test facility. Their first stop is patient zero, Tim Fanning. Beating death, the former doctor has slowly morphed into something out of a nightmare. 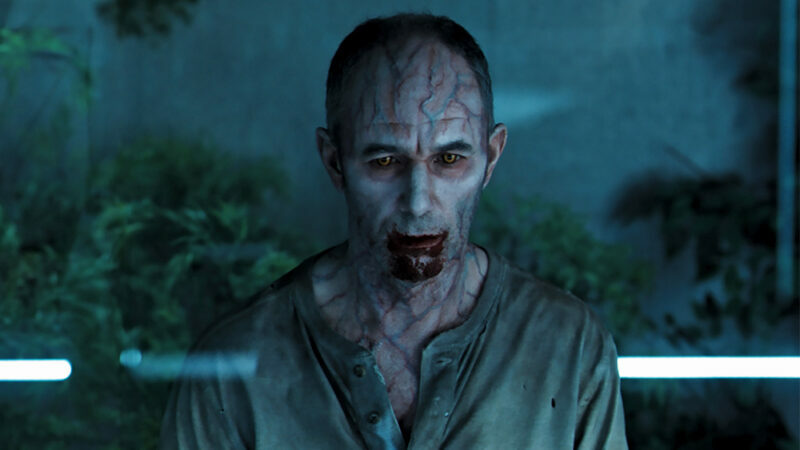 Dr. Daniel Pet (Alain Uy) explains to his colleagues that despite his mutated form, Tim is immune to disease, and although he has to drink blood to survive, he is not a vampire. Each test subject they looked at had different characteristics or different time frames in which the mutation occurred. Age is a major factor; the younger the test subject, the longer it takes for the mutation to occur. Dr. Pet suggests using a child could solve the crisis. After bringing Carter to Project Noah, Wolgast and Doyle are sent out to find a child in the foster care system. They find 10-year-old Amy whose mother died of a drug overdose only three days earlier. With no remaining family around to help her, Amy is the perfect candidate for their child test subject. Wolgast and Doyle visit Amy at the foster home she was temporarily staying at. Amy could see right through their motives and lies, but her foster mom was all to0-willing to get rid of her. Amy escapes from a bedroom window when trying to run away. The chase is on, but Wolgast is less than eager to chase after Amy. Doyle, on the other hand, has no problem running after the 10-year-old. Doyle eventually catches Amy in a public park as Wolgast hangs back, obvious that he does not want to be a part of this kidnapping. Doyle throws Amy to the ground and hits her, while witnesses see the entire situation. While driving, Wolgast stops the car right before he grabs Doyle’s head, slamming his face in to the dashboard. Angry, Wolgast warns Doyle that if he touches Amy again he will kill him. It becomes clear that Wolgast cares about Amy and her safety. When he gets a call from Project Noah headquarters, he starts to doubt whether he can even go through with bringing her to them. Warned by Clark of the consequences of what will happen if he does not follow through, Brad continues on with the mission. Amy ends up getting car sick, and Wolgast’s fatherly instincts kick in. Viewers begin to see the trust starting to form between them. Amy is still resistant to Wolgast’s efforts, but it becomes a turning point for them, and Amy starts to call him Brad. Back at Project Noah, Jonas stands alone watching Tim like a museum exhibit. Jonas does not see the monster that Tim has become, only his friend. Gentle music is playing in the background in hopes that Tim will respond. Jonas is joined by Pet who suddenly shares with him the reoccurring dream of Tim he has. It is soon learned that many other scientists have had the same dream about other test subjects, putting into question whether they were really dreams. Continuing on their journey, Brad, Doyle, and Amy stop at a carnival. Doyle is unenthusiastic about the last-minute stop, even asking why he cares so much about the little girl. Keeping his calm, Brad tells Doyle to stay while he takes Amy to play a few games. Walking past the booths, something catches Amy’s eye- a giant stuffed unicorn. Seeing how much Amy wants it, Brad tells her he is going to win it for her. Amy questions whether Brad can even shoot the metal rabbits making him more determined than ever to show off his marksmanship. Needing to hit the target three times, Brad gets it in the first try. He proceeds to ask Amy if she wants to try. She, of course, does not know how to shoot the gun. A hilarious argument breaks out between them with Brad trying to convince her to give it a try while Amy refusing. She finally agrees. Brad stands behind her directing her in what to do. Listening to his advice, Amy hits the targets both times. Amy Bellafonte (Saniyya Sidney) and Brad Wolgast (Mark-Paul Gosselaar ). Photo courtesy of IMDb. “Holy damn it! Did you see that?” Brad shouts turning around showing off Amy to the onlookers like a proud father. Turning back Amy he tells her, “Pick out your prize Sweetie,” and it is in that moment, their bond is clear. Doyle comes looking for Brad and Amy, asking if they are ready to go. Doyle tells them he is going to use the restroom. Brad is quick to follow. Sneaking up on Doyle, Brad chokes him out leaving Doyle on the bathroom floor. Running back to Amy, Brad tells her there has been a change in plans and he will not be taking her to Project Noah. The two go on the run together. The next day, the home office learns about what Brad did. Worried about what Brad might do, a nationwide search begins for him and Amy. Meanwhile, Brad and Amy make a quick stop at a river. After Amy asks why they had stopped, Brad asks if her mom had a funeral. Amy tells him no. Visibly angry about her mother, Brad encourages Amy to share her favorite memories. Slowly Amy opens up, talking about the donut cake her mother made for her birthday, and how she would let her lay in her bed and watch movies. When Amy explains that her mom called her the joy of her life, she begins to cry, and Brad holds her, letting her know that she is protected and safe. 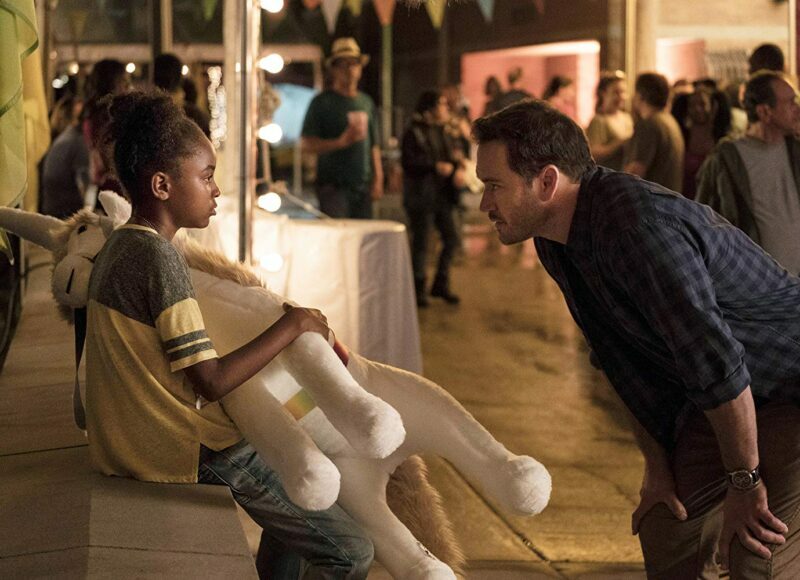 Brad Wolgast (Mark-Paul Gosselaar) and Amy Bellafonta (Saniyya Sidney). Photo courtesy of IMDb. Back at Project Noah, their new arrival, Carter, is undergoing a physical exam. Suddenly, a perfectly healthy Dr. Tim Fanning walks in. As Tim introduces himself to Carter, he slowly morphs back into his mutated form. Carter wakes up gasping for air. Still resting in the examination room, Carter realizes it was a dream. Tim, who he never seen, was in his head. Stopping at a gas station for a quick a snack, Brad sees himself on the news for kidnapping. Returning back to the car, he notices a police officer getting gas. Unable to hide how nervous he is, Amy asks why they aren not moving. Brad turns to Amy and tells her that he is going to surrender. He believes that if he surrenders and they get on TV then everyone will know who she is and no one can hurt her. Finally making up his mind, Brad leaves the car introducing himself to the police officer. Brad and Amy end up at the local police station waiting to see what will happen. When Brad asks the arresting officer if he heard anything from his agency, a call comes in from the Department of Defense (DoD). It becomes clear that his plan was not going to work. Brad asks Amy, who is not in handcuffs, to steal the key. As soon as the call comes in, black SUVs pull up, and leading the pursuit is Clark. Amy is able to find the handcuff key to free Brad. After being noticed by an officer, Brad knocks him out and takes his gun for protection. Clark runs into the police station and a shootout begins between him and Brad. Clark ends up shooting another officer in his attempt to get to Brad and Amy. Refusing to give up, Brad and Clark go head to head. Dead set on making sure Amy stays safe, Brad uses his body to protect her. While making their escape, Brad is shot by Clark. Finally exiting the police station, Brad and Amy get away in a police car. The audience is taken back to Amy staring out the window as she looks back at Brad as the black SUVs close in on them. New episodes of The Passage air Mondays at 9/8c on FOX.